Even in a country where Chris Matthews is a media celebrity and Pamela Geller is an intellectual, the statement would be scandalous, a political death wish even. In Israel, however, the opposite is true. Netanyahu’s fight was not exactly against the Arabs. The Joint List, which united various Arab parties as a response to new Israeli laws aimed at reducing their representation in the Knesset, came third with 14 seats. Though this is an impressive showing nonetheless, it falls short of being an imminent threat to Netanyahu or the Labor (Zionist Union) Party. Using an imagined Arab threat as a fearmongering tactic is an Israeli political staple. It is a notion founded before the creation of Israel over the ruins of historic Palestine in 1948. But what makes Netanyahu’s latest statement more important than usual is that the Israeli leader blew to bits a well-guarded secret – at least in mainstream media – that Israel is a racist country. Not only did Netanyahu make the racist call to save his career and stay in the race, he actually won with a substantial margin precisely because of that very call. Indeed, racism was in fact the reason behind his “surprise” election victory. He is now on his way to becoming a prime minister for the fourth time, as his Likud Party secured 30 seats in the 120-member Knesset. The supposed “left” mostly represented in the Zionist Union won 24 seats, although their political programme was virtually indistinguishable from Likud. For Netanyahu’s main challenger, Isaac Herzog, Palestinians hardly existed. The occupation was a non-issue for him and for most Israeli political rivals for that matter. His foreign policy programme was either identical to Netanyahu’s or was largely based on deferring foreign policy issues to a later date. The soft-speaking Herzog had no qualms about keeping the illegal Jewish settlements intact – which stands at the crux of Israeli military occupation of Palestine. Although Netanyahu vowed to oppose a future Palestinian state – raising concerns among his Western allies – Herzog, too, practically opposed a contiguous and sovereign Palestinian state because no such state could possibly co-exist with colonial settlements and military occupation. However, the US administration and media pundits didn’t seem to be bothered by Herzog as they were by Netanyahu’s grandstanding over Arab voters being bussed in droves or his intentions to block a Palestinian state. If the prospective foreign policy outcome of both leaders would have been the same, why didn’t the Obama administration object as strongly to Herzog’s political programme as to Netanyahu’s racist rants? One of the reasons is that Netanyahu deviated from an unwritten script that sustained the Washington-Tel Aviv alliance for decades and has served as the central discourse to the so-called peace process. According to that script, Israel is allowed to virtually do as it pleases in Palestine as long as it adheres to a strict, agreed upon narrative. But in his hunger for power and in line with his unquenchable arrogance, Netanyahu violated the code. For Washington, a red line is being frequently crossed and it is becoming increasingly difficult for Washington to maintain a special relationship with Israel, which, under Netanyahu is paying no heed to the foreign policy interests of the United States. Despite protest by the Obama administration, Netanyahu’s triumphant speech in US Congress on 3 March was perhaps the most humiliating political episode in US politics in many years. In the long run, that strategy could backfire. Netanyahu’s antics are increasingly denying the US administration a prolonged, tired and failed discourse pertaining to the peace process, Israeli security, democracy and so on, leaving the White House with two stark choices: to follow the lead of a racist and obsessive Netanyahu (as many Republicans and Democrats have already done) or to part ways. Thanks to Netanyahu, some of the misleading Israeli myths promoted as facts by Israel supporters are now falling apart. First, Israel cannot be a Jewish and democratic state. There is no such thing. Jewish democracy is as flawed as any democracy that promotes the interest of any specific racial or ethnic group at the expense of all others. The collective cognitive dissonance that has been streamlined into Israeli thinking that democracy can be tailored to fit racial and ethnic needs is completely unacceptable as a sensible democratic standard. Democracy is grounded on pluralism and inclusion, not racial exclusion and fearmongering about Arabs voting in droves. The fact that 4.5 million Palestinians don’t have the right to vote in an area under Israel control says volumes. The fact that Palestinians who voted in a democratic Palestinian elections in 2006 are still suffering a punishing siege to this day because of that choice, is particularly devastating. Second, Israel is not an American ally and there is no “special relationship”. Netanyahu’s speech about Iran at the US Congress in defiance of President Obama and declared US foreign policy on Iran’s nuclear programme was the last nail in the coffin of the tired argument that Israel and the US are unified by a clear set of mutual interests. The “tail wagging the dog” argument is back in full force, and Americans must understand that their country’s political elites are torn between the interests of their country and those of Israel. No amount of reasoning about the “special relationship” will rectify the damage created by Netanyahu. Third, the peace process was a farce from the start. In fact, it was designed to be a farce, meant to manage but not resolve the conflict. 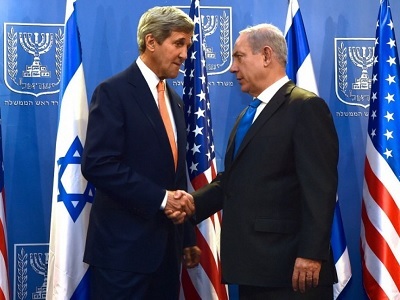 The Americans had come to terms with the idea that they cannot pressure Israel to alter its policies, thus designed the peace process as a way to promote an illusion that a two-state solution to the conflict is still possible, placing the US at the helm of being a mediator between both parties. It mattered little if the “peace process” dragged on for a century more, as long as both parties remained verbally committed to the unfeasible idea of a two-state solution. While Palestinian Authority President Mahmoud Abbas kept reiterating his lines as requested by Washington – in exchange for money and political support from the US and its Western allies – Netanyahu reneged, not just unmasking Israel, but exposing the American-led farce altogether. With no two-state discourse, there is no peace process, thus there is no American strategy in the Middle East and this leads to the question: now what? As for Palestinians, they are not exactly “happy” that Netanyahu has won, but some see his victory as an important step towards confronting the 20-year charade of the peace process. They are not “relieved” that a man with a racist and bloody legacy will invite more terror and war, but they understand that regardless of the outcome, their suffering will endure, as will the siege and the occupation. While there is little that Palestinians can learn from the outcome of Israeli elections, there is much for Americans to think about. Awesome, Ramzy. Arrogance finally does lead to a fall, as I hope Mr. Netanyahu’s will do for Israel’s future as a “Jewish and democratic” state. He has successfully humiliated the USA’s political elite right up to the Oval Office, in spite of Senator McCain’s howling at President Obama saying “awful” things about PM Netanyahu’s vile behavior, which says a whole lot about where Senator McCain’s loyalties are. Excellent analysis as usual. Although Palestinians are not “relieved” by the election results, they are understandably pleased that the mask has been removed. Truthfully the mask is more a product of selective MSM reporting than anything else, as Israeli leaders from Netanyahu on down have never been shy in proclaiming their contempt for Palestinians. As you point out, however, by deviating so overtly from the Washington- Tel-Aviv “peace process” script, Netanyahu bit off more than he could chew and exposed the charade for all the world to see.